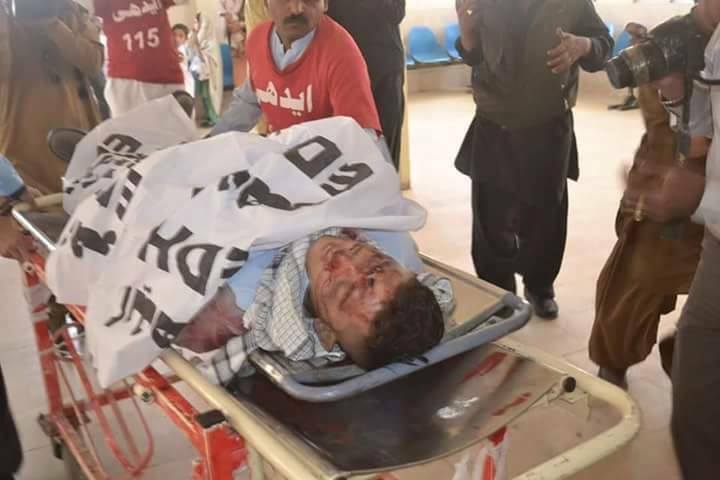 JNN 27 Apr 2015 QUETTA: At least two Shia Hazara men were martyred and another wounded as the Notorious Wahabi terrorist opened fire on a bus carrying pilgrims near the Chandni Chowk area in Quetta’s Satelite Town on Monday. The bus, carrying pilgrims belonging to the Shia Hazara community, was travelling from Quetta to Taftan, a town on the border of Iran. A large number of security and rescue personnel reached the spot after the attack , which is situated in the outskirts of the provincial capital city of Balochistan province , But the assailants manage to escape the Crime scene un interrupted . Rescue workers shifted the victims to the Civil Hospital Quetta for treatment. The Martyrs of the Incident are Identified as Mirza Hussain Asadullah and Muhammad Ali . On the same Day in Peshawar , Another Shia Man , Abid Hassan Qazalbash was also martyred by the same Brand of Wahabi Terrorist in the area of People Mandi , Peshawar. Abid was on his way , as when he reached near Yadgaaar Chowk , he was ambushed by the Assailants of SSP , The Terrorist of SSP Opened Indiscriminate fire on him , due to which he was fatally injured , after the Incident he was rushed to the Lady Reading Hospital , But he could not survive and embraced Martyrdom on the way . He was a well known Personality for his community work , while he had also worked in the capacity of a Local Bodies Councillor from his area . His Brother Wajid Hassan was also Martyred earlier by Wahabi Terrorists , Last Year on 11th Nov ‘2014 . It should be noted that these are not the first Incident of attack on shia Pilgrims travelling to Iran and Shia Target Killing , But it is shocking at a time when full scale Country wide Operation against the terrorists is going on , but due to some Black sheep presence in the PML – N led Government , the Notorious Wahabi terrorist Group of Tehrik e Taliban Pakistan ( TTP ) and its offshoot Political / terrorist Group Sipah e Sahaba Pakistan ( SSP ) and allied Groups are still , under the Patronage of PML – N Government , and No action is Initiated against them . As they are Being Promoted Not Only by PML – N Government But at the same time Sponsored By Saudi Government , which can be verified by the Direct Contacts of the Saudi Dignitaries , who are on frequent visits of Pakistan these days are Openly Patronizing and sponsoring these Wahabi Terrorist Organizations which are been declared direct threat to the existence of Pakistan ,as these sponsorships and Promotion of such terrorist Organizations are Once again active in Putting the future of Pakistan in Dark , to save their Own Monarchies , in the Name of Islam , as the Imam of Kabaa , who should be a symbol of Unity and Harmony of all the Muslims of the World , but in Contract in his latest trip to Pakistan , he was noticed in doing Back Door Diplomacy and Lobbying to create a general consensus , in getting the Pakistan Army’s support in Pushing the Pakistani Soldiers Lives in the Deepest Hell of Saudi Aggression on Innocent Yemeni Civilians , in order to Save their Sinking Monarchies . As it is Pakistani Government Duty to Keep a close check on any foreign or Domestic forces , Openly promoting Sectarianism and terrorist Outfits , who are at Present being Openly Promoted and sponsored by the visiting Saudi Dignitaries , Including Imam of Kabaa , Khalid Ghamdi who is busy all these days in gathering support of Wahabi ( Deobandi ) and Ahle Hadith Organisations , to incite them to stand Up against the General Public Consensus of Pakistani People , in Not Jumping into Saudi Aggression on Innocent Yemeni Civilians , which is being carried out to save their already Sinking Monarchies and Sheikhdoms. This entry was posted in Jafria, Middle East, Pakistan News and tagged Abid Hassan Qazalbash, Civil Hospital Quetta, Community, Imam e Kabaa, Innocent Yemeni, iran, Khalid Ghamdi, Mirza Hussain Asadullah, pakistan, Quetta, Saudi Arabia, shia Target Killing, terrorist organizations, the General Public Consensus, The Terrorist, Wahabi, Wahabi Terrorist. Bookmark the permalink.